In wartime, Americans supporting the Revolution had vowed to give up foreign imports, with some advocating for “homespun” – fiber that was grown, spun and woven locally. However, there was no way we could supply ourselves with enough textiles for clothing and furnishings. Many American women didn’t know how to spin or weave and England forbade the export of new forms of textile machinery in order to protect their industry. Once peace was declared, fervor for “homespun” died down—but a debate still raged in the press about whether we should follow European fashions. Fashion was portrayed as a sinister foreign influence, a “tyrant”—and we’d just fought a war against tyranny! Critics believed we should strive for cultural and economic independence — not just political. “An American ought not to ask what is the custom of London and Paris; but what is becoming our dignity? Instead of this…every fashionable folly is brought from Europe, and adopted without scruple in our dress, our manners, and our conversation,” wrote Noah Webster, whose dictionary later struck a blow for linguistic independence. Yet we’d also fought for the pursuit of happiness, including access to nice things. 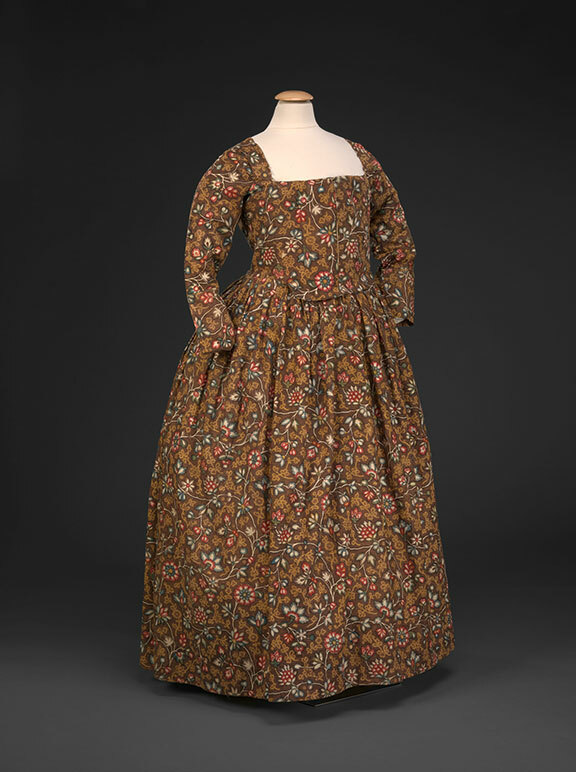 Men and women alike continued to look to England and France for fashion and to fabrics imported from China, India and Europe. 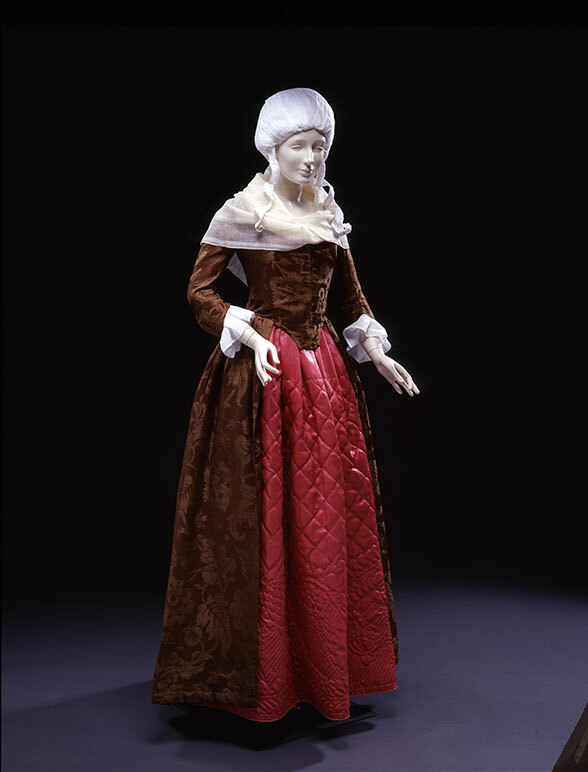 Styles of the early 1780s continued the look of the 1770s. 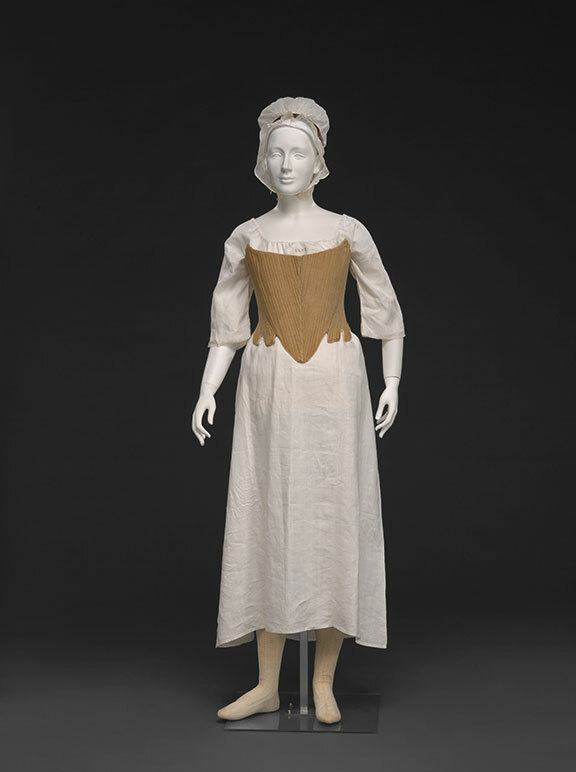 Women’s dresses were worn fitted over the stays (corset), opening in front over a petticoat (underskirt) and worn over several layers of under-petticoat, and often a padded roll around the waist called a “bum roll.” One style innovation was a new way of cutting and piecing the back bodice, rather than pleating a single piece of fabric into shape. 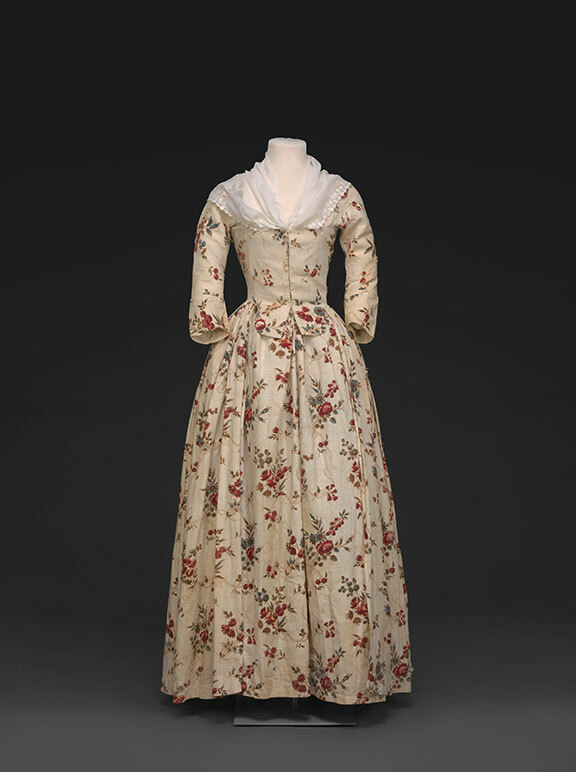 The 1780s saw the increasing popularity of the “round gown,” in which the front panel of the dress was filled in with more of the same fabric instead of being worn over the exposed petticoat. 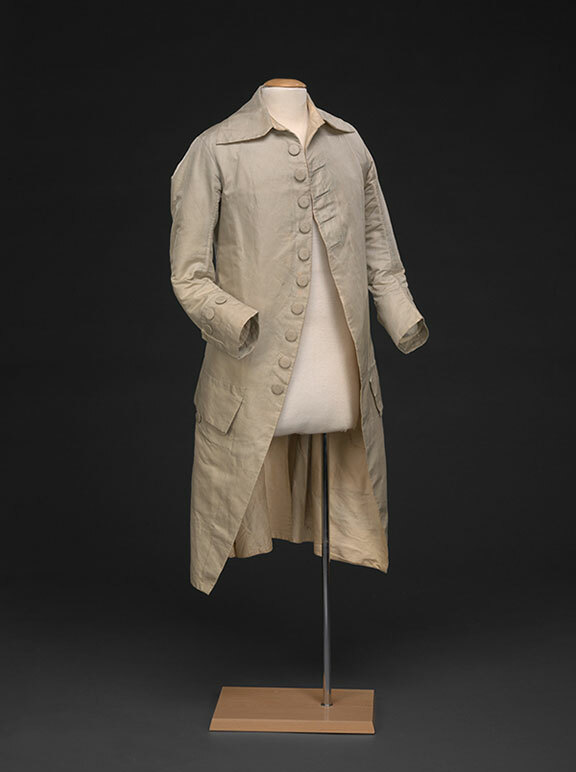 Men continued to wear coat, waistcoat, and breeches, sometimes matching two or all three of the fabrics. Trousers and short jackets were sometimes worn by working men. By decade’s end a slimmer silhouette was in style for both men and women; shorter waistcoats and women’s wide sashes heralded rising waistlines for both sexes. The extremes of fashion seen in French and English fashion illustrations were interpreted more conservatively in America to suit local standards of taste and modesty, as had been the case before the revolution. Virtually nothing was available ready-made in the 1780s. Skilled tailors and dressmakers cut garments to fit individual clients, though thrifty customers might sew them at home. Most fabric was imported, from the cheapest fabrics assigned to the enslaved, to the fanciest silks imported from Europe or China. America did not have a commercial textile industry capable of producing significant amounts of common fabrics and none at all to make the luxurious options.